10. class-orientated content to instill habits of obedience, timidity, and orthodoxy. As one (who?) university president put it, one should not "be so presumptive as to feel that his knowledge is so vast as to criticize something so complex as a whole society." Where do students go? Of the 1969 June graduating class, 20% went into the Armed Forces, 53% went into business, governmental or persuasive (advertising)? jobs, 10% went into education, 10% went into engineering. Of the men , 80% got jobs paying less than $10,000 a year. Of the women, 70% got jobs paying less than $7500 a year. Above all, the university is designed to produce good workers. III. 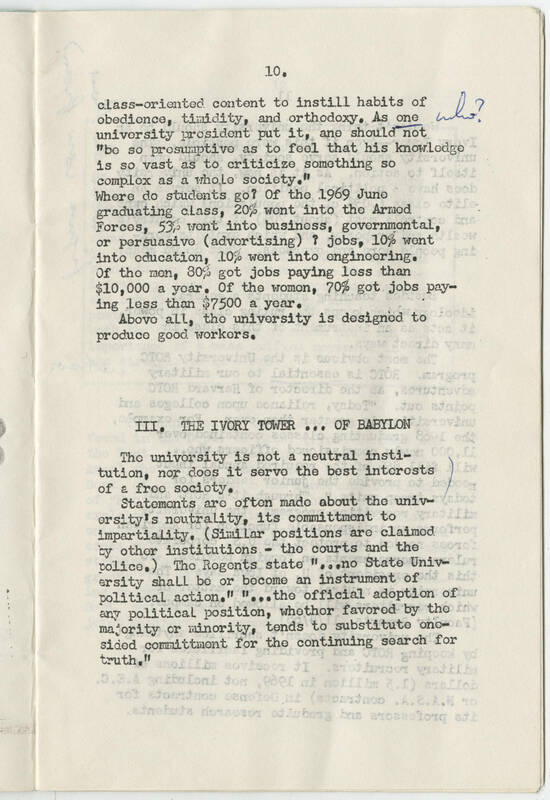 THE IVORY TOWER ... OF BABYLON The university is not a neutral institution, nor does it serve the best interests of a free society. Statements are often made about the unviersity's neutrality, its commitment to impartiality. (Similar positions are claimed by other institutions - the courts and the police.) The Regents state ".. no State University shall be or become an instrument of political action." "... the official adoption of any political position, whether favored by the majority or minority, tends to substitute onesided commitment for the continuing search for truth."